Although not as Blackberry handset brand, which is at once the service server, the iPhone has a superior service based on internet, that is, the iTunes Store. Before signs present iPhone, software and services store digital content can not be accessed by iPhone users in Indonesia. Now it is certainly different. Facilities and infrastructure to maximize the iPhone can already be done, though less perfect in the digital music store. Unfortunately, the price offered so high, that does not directly map the market will create itself. What performance? I will study here. Views on the iPhone 3G is still basically the same as the beginning of the next generation iPhone. Forms have been imitated by many mobile phone brands with a local Chinese. The broad surface of the phone screen with more dominant. However, different from the first iPhone, this phone uses a plastic material, especially on the back. Compare with the aluminum theme that brought the previous iPhone. But it does not mean the back of the new iPhone can be opened such as mobile phones made in China. No, it is the same with the iPhone before the iPhone battery stored in the device this meeting. That is, the SIM card is home made separate, no longer put a room together with a battery as a normal mobile phone. Complaints may be on the glossy plastic material and glass screen protector phone. Almost all parts of a magnet for fingerprints. In fact, the finger is the main tool to interact with the iPhone 3G. not found the button on the phone. A number of the volume keys, power button at once and stand by a switch lock profile (mute) will accompany the present home button below the main screen. iPhone 3G uses the operating system that is dderivat from Mac OS X. call as part of the iPhone OS, but there is also a call OS X iPhone. This system provides the iPhone's unique interface, which is using the concept of direct manipulation through a variety of movement via the touch teknoligi Multi Touch. That is, the system will recognize the touch in a variety of profiles. For example, when we only intend replace the menu page, then the movement of fingers caress akan translated well. iPhone mobile phone has been recognized as the most revolutionary Touch UI. So do not wonder if the latest mobile phone, the iPhone 3G is not an obstacle. There is a TFT touch screen support is referred to as the capacitive touchscreen, with a diagonal size of 3.5 inch, QVGA resolution and 24 bit color depth then presented the view that solid look. Menu will appear in the grid with interesting icons. This type of view has been imitated by some mobile phone made in China. There are two parts here. The most knowledgeable in the area above. Here we can add many new menu icons to reach back to some of the pages. While the second is in the bottom tier, consisting of 4 icons the function of the phone, mail, web browser (safari) and iPod (multimedia player). Like the old Apple device, such as the iPod. iPhone 3G also has connectivity to the device requires a computer. Create you own a notebook or laptop computer and Windows is also the basis for the Mac, this is not a problem. Since activation, we are required to connect the iPhone 3G to iTunes desktop software as a suit ago to connect to the internet. Therefore the store, which was appointed to sell the iPhone 3G activation will be conducted prior to this phone you can take home. Describe the first iPhone as an iPod that can be used for the phone. Although not precise, as this supposition can not spelled wrong also. 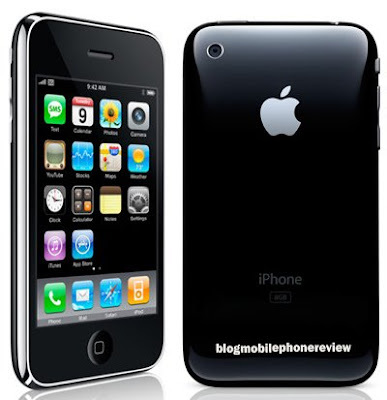 With the interesting design of Apple iPhone 3G still an entertainment device the withdrawal of circulating iPod first. iPod itself is a trademark owned portable music player Apple. Not only as the name of a hardware, iPod in the iPhone is also a multimedia software which consists of a number of entertainment functions. First that we can get is a music player. Type of format that is supported very diverse, ranging from MP3, M4A, AAC and WMA. For the last mentioned earlier, there will be efforts made the previous conversion by iTunes desktop is the backbone of the iPhone functions as a whole. Synchronize music player 3G iPhone with iTunes is a must. As with iPod, transfer music can only be done through a desktop music player this. How you enter the itunes music files in the computer, and the synchronization, file akan dn sent directly to the iPhone. The mechanism is different reap the positive and negative responses. For the positive terms, the device iPhone you will be more personal. How not, when the computer is connected to iTunes and synchronized others, the music files that come from the computer you will be deleted and replaced with the music files on the computer. For negative terms, this is for some people is making. Other mobile phone users can use drag and drop or copy / paste of the music files they want to enjoy from their mobile phone to the computer. Besides the music player, the iPod can also enjoy our videos, podcasts and audiobook. Overall the system uses the same file transfer, namely through the iTunes desktop. Unfortunately, although supported by the big screen, the video format is still limited to 3gp and mp4 only. For audio output, use the iPhone 3G two of the main speakers are placed near the mobile phone data port and 3.5 mm audio jack. although it has two separate shaft, the sound produced is not so stereo speakers. This is different with the support of 3.5 mm which is quite satisfactory. Create you own a stereo headset Buletooth, certainly disappointed because there is no A2DP support on the phone. Although there are reasons that reasonable enough, so that we can hear the best sound quality through headphones or using a cable that does not keep the battery runs out quickly due to the activation Bluetooth. To enjoy the iPhone via a Bluetooth headset we have tried A2DP Bluetooth converter for iPod. However, there is no report about compatibility. 3G in the name iPohone 3G not only to differentiate the device with the previous product. In fact, mobile phone 3G iPhone has been supported by the data network's maximum speed 3.6 Mbps via a channel WDCMA / HSDPA 850/1900/2100 MHz. High-speed data channel will give users flexibility in the iPhone 3G in the data path to access the area with a wider scope. For a more narrow area, we can use other means such as Wifi connection. During this we are in the hotspot, we can access the internet with a steady speed. Wifi connection is very useful when we download an application that is larger than 10 MB. Because the system only allows HSDPA iPhone to download files with size smaller than that. Means of connection is Bluetooth. But Bluetooth is here used to accommodate the many aliases used for hands-free Bluetooth for handsfree phone only. iPhone 3G does not have the ability to send files via Bluetooth to other devices. The main reason for this limitation is to prevent the spread of piracy and file. While the iPhone browser that is used is a browser developed by Apple, Safari Browser. Does not look much different with the other browser, but with support for the touchscreen interface is developed, this browser are most suitable to the iPhone. Safari brings Google as default search site. Additional services that can be enjoyed on the Iphone 3G is a direct access to the iTunes store and the Application store. Just remind, two links to the digital online store is owned by Apple, known only as the iTunes store in iTunes desktop. Meanwhile, when moved to the handheld device, divided into two different stores. One example application is provided free facebook iPhone. Facebook iPhone has a better view and a more perfect inerja compared with the Blackberry property. But to be able to enjoy, we must have the iTunes account. You can register your phone number is in the iPhone that can download directly via mobile phones. Unfortunately, to create an account, we also need to have a credit card. iPhone 3G equipped with internal GPS receiver. The performance of the GPS mobile phone with others. That is, the GPS device is not for navigation of the absolute, but a direction we know it. Unlike the portable GPS device that is made for a more serious purpose. Many things you can do this with the GPS, in addition to the GoogleMap provided, we can also add geo-tags your photos and facilitator of the third party applications on the location information. No information about the capacity of the battery used iPhone 3G. but Apple claims that the party that brought the capacity better than the previous product. This is because the presence of features that HSDPA will drain more energy. With the normal use of the browser, iPod and camera, this phone can survive 1.5 days in one charging.